Heat oven to 350°F. Unroll pie crust on ungreased cookie sheet; prick generously with fork. Bake 5 minutes. 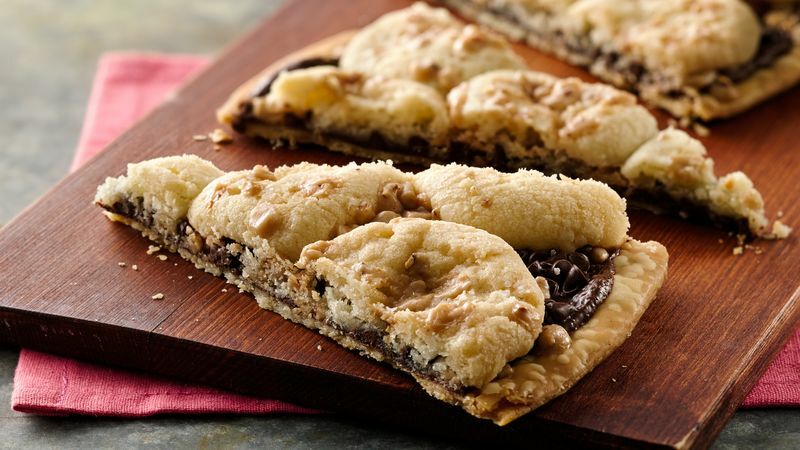 Spread chocolate hazelnut spread evenly over crust to within 1/4 inch of edge. Sprinkle with chocolate chips. Cut sugar cookies in half horizontally. Place over chocolate hazelnut spread, 1/2 inch from edge and about 1 inch apart. Sprinkle with toffee bits and salt. Bake 20 to 25 minutes or until pie crust edges are golden brown. Cool 30 minutes; cut into wedges.